Whoever would have thought that the “grow your own vegetables” craze would have lasted so long and gained such momentum? I can remember being considered rather odd when I took on my first allotment more than 15 years ago with the idea of providing some good quality cheap food for the family. It was also a way of escaping city life and returning to my roots (I grew up on a farm in Somerset, where we were almost self-sufficient, producing all our own meat, milk, fruit and vegetables). With an ever-increasing interest in eating healthy, locally produced food, this is the perfect time to get your hands dirty, get out there and have a go. From talking to people about this, it seems the most daunting prospect of growing your own produce is where to start. If you have a plot already, great; if not, try digging up some lawn or flower borders. The secret is to not make it too large: three beds about the size of a small garden shed (1.8m or 6 ft x 1.8m) will produce plenty of vegetables in your first year. I am a great advocate of keeping it simple and starting with easy produce for anyone new to this. With this in mind, potatoes have to be high on the list. Not only are they easy to grow, but they taste fantastic and are a great crop for breaking up new ground. 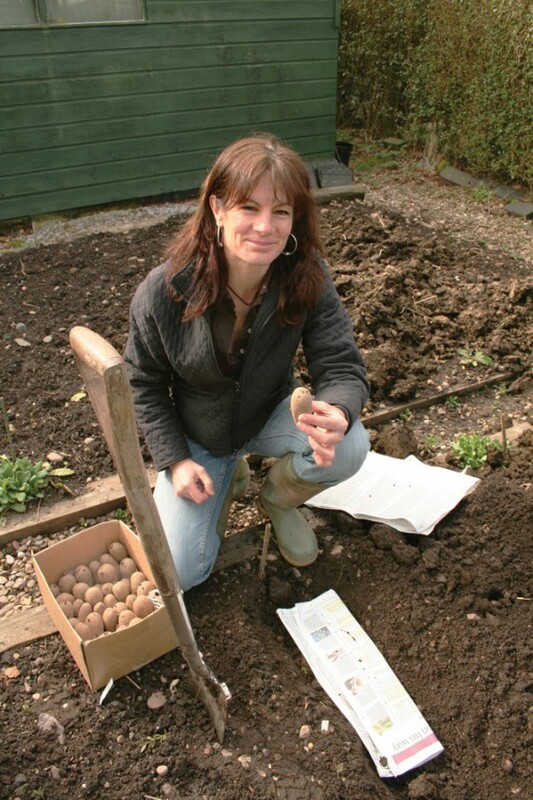 Once your seed potatoes have “chitted” – this means they have started to sprout when stored in a warm dry place for a few weeks – dig a trench 15cm or 6in deep. Add plenty of well-rotted manure in the bottom. Some of the old guys on the allotment also encouraged me to put in a layer of newspaper, to stop the potatoes rotting when they came into contact with the manure and to help prevent perennial weeds coming through. I have tended to keep this up as good practice ever since. Your potatoes should be put in at about 30 cm or 12in apart, for salad and new potatoes, a bit more for the main crop varieties. Make sure you leave 45cm or 18in between the rows to give you plenty of room for “earthing up” once the potatoes start shooting through. Earthing up is when you scrape the soil up around the newly emerging plants, to stop the developing potatoes from getting any light on them and turning green. You should be able to see where you have planted the potatoes by creating a small mound over the row. Once your spuds are in the ground, April is the perfect time to get going on lots of other crops as the soil is much warmer and the days longer, and so many seeds can be sown directly into the ground. All the salad crops including lettuce, rocket, beetroot for its young leaves and spring onions will do well if planted out now. To make it really easy try the “cut and come again” varieties. These you literally sow in place and they produce a mixed crop of leaves that you cut off and they spring up again. To keep a constant salad crop going through the summer, just plant out a new row every few weeks to replace the plants when they get too old and leggy. I have started a variety on my window sill this year to plant out soon – I couldn’t resist it as it is called “Drunken Woman”, so I have grown a few extras to give away to my female friends, but only the ones who might need to cut down on the booze a little! The packet describes the lettuce as “an Italian heirloom variety with red and green bi-coloured leaves that tend to flop over”, hence the name. Towards the end of April and into May you can start to plant out the more tender crops like courgettes and beans – this really needs to be done only when all danger of frost has passed. I am also going to plant sweet peas on my bean canes again this year, providing me with plenty of scented flowers for the house and attracting lots of bees and beneficial insects to help pollinate my beans and set pods. For anyone who has read this and is thinking they don’t have the room to grow any vegetables, here is a novel idea I came across recently. The charity “Send a Cow to Africa” has not only been giving cows away to small communities in southern Africa, but has helped many small farmers grow vegetables in large sacks. The charity is currently running a campaign to bring this idea to the UK, and by buying a bag and seeds you also donate to the charity. A great idea for anyone with very little space and it helps a worthy cause.